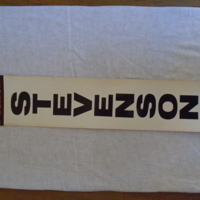 1982 or 1986 Campaign Sign Adlai Stevenson III for Illinois Governor. Mr. Stevenson ran for Governor of Illinois in 1982 and 1986, losing both bids to James Thompson. As the 1982 gubernatorial candidate, Mr. Stevenson ran as a Democrat. As the 1986 candidate, he formed and ran under the Solidarity Party ticket. Since no dates or party affiliation are on the sign, it could just as easily belong to one campaign as the other. Campaign Sign for Adlai Stevenson III for Illinois Governor. Dated either 1982 or 1986. Both bids were unsuccessful, losing to James Thompson both times. “Campaign Sign Adlai Stevenson for Illinois Governor,” UIS History Harvest, accessed April 22, 2019, http://uishistharv1.uis.edu/items/show/127.